Getting There: Boise is served by United, Delta, Skywest, Northwest, Southwest and Horizon airlines. You can find the Web sites and 800 phone numbers for these airlines on this sites Airlines page. McCall Airport has excellent facilities for private aircraft. 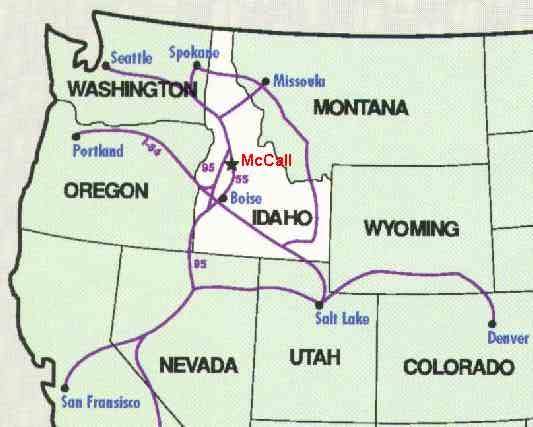 Aircraft operators based in McCall include Pioneer Air Service 208-634-5445 and Idaho Heartland Travel 208-634-8650. Boise car rental agencies maintain autos equipped for winter driving conditions. You can find the Web sites and 800 phone numbers for the major car rental agencies on this sites Autos page. Staying There: McCall has a variety of other accommodations  from the elegant to the comfortably satisfying. Recommended establishments include Shore Lodge, Bear Creek Lodge, and Hotel McCall  all charming establishments, steeped in character. Shore Lodge: 208-634-2244 or 800-657-6464 (ask for lodge and lift package). 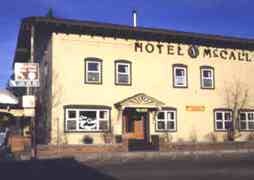 Hotel McCall: 208-634-8l05 or Fax 208-634-8755. Bear Creek Lodge: 208-634-3551 or 888-634-BEAR. - 1999 adult lift tickets are $29 ($24 for seniors), juniors (l3-l8) $24, child (7-12) $l7, child 6 or under, free. A family season pass at Brundage is a steal at $895. - Ski Brundage and CatSki Adventures: l-800-888-7544 or 208-634-4l5l. - Nordic Skiing: Payette Lake Ski Club: 208-634-569l. - Snowmobiling:: McCall Snowmobile Club (Rick Tidmarsh): 208-634-8605. - McCall Chamber of Commerce: 208-634-7631/Fax 208-634-7752. - Ponderosa State Park: 208-634-2l64. - Blue Moon Outfitters winter culinary adventure: 208-634-3111. - Shore Lodge, Dining: 800-657-6464. - McCall Brewing Co: 208-634-2333.